With the U.S. presidential election nearly here, everyone seems to have politics on their mind. Unlike most people, economists tend to have an indifference towards voting. The way economists see it, the chances of an individual’s vote influencing an election outcome is vanishingly small, so unless it is fun to vote, it doesn’t make much sense to do so. On top of that, there are a number of theoretical results, most famously Arrow’s Impossibility Theorem, which highlight how difficult it is to design political systems/voting mechanisms that reliably aggregate the preferences of the electorate. Mostly, these theoretical explorations into the virtues and vices of democracy leave me yawning. Last spring, however, my colleague Glen Weyl mentioned an idea along these lines that was so simple and elegant that I was amazed no one had ever thought of it before. In Glen’s voting mechanism, every voter can vote as many times as he or she likes. The catch, however, is that you have to pay each time you vote, and the amount you have to pay is a function of the square of the number of votes you cast. As a consequence, each extra vote you cast costs more than the previous vote. Just for the sake of argument, let’s say the first vote costs you $1. Then to vote a second time would cost $4. The third vote would be $9, the fourth $16, and so on. One hundred votes would cost you $10,000. So eventually, no matter how much you like a candidate, you choose to vote a finite number of times. What is so special about this voting scheme? People end up voting in proportion to how much they care about the election outcome. The system captures not just which candidate you prefer, but how strong your preferences are. Given Glen’s assumptions, this turns out to be Pareto efficient — i.e., no person in society can be made better off without making someone else worse off. The first criticism you’ll likely make against this sort of scheme is that it favors the rich. At one level that is true relative to our current system. It might not be a popular argument, but one thing an economist might say is that the rich consume more of everything – why shouldn’t they consume more political influence? In our existing system of campaign contributions, there can be little doubt that the rich already have far more influence than the poor. So restricting campaign spending, in conjunction with this voting scheme, might be more democratic than our current system. Another possible criticism of Glen’s idea is that it leads to very strong incentives for cheating through vote buying. It is much cheaper to buy the first votes of a lot of uninterested citizens than it is to pay the price for my 100th vote. Once we put dollar values on votes, it is more likely that people will view votes through the lens of a financial transaction and be willing to buy and sell them. Given we’ve been doing “one person, one vote” for so long, I think it is highly unlikely that we will ever see Glen’s idea put into practice in major political elections. Two other economists, Jacob Goeree and Jingjing Zhang have been exploring a similar idea to Glen’s and testing it in a laboratory environment. 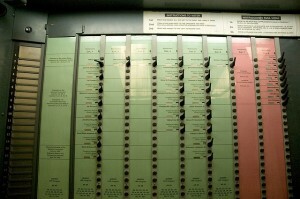 Not only does it work well, but when given a choice between standard voting and this bid system, the participants usually choose the bid system. This voting scheme can work in any situation where there are multiple people trying to choose between two alternatives — e.g., a group of people trying to decide which movie or restaurant to go to, housemates trying to decide which of two TV’s to buy, etc. In settings like those, the pool of money that is collected from people voting would be divided equally and then redistributed to the participants. My hope is that a few of you might be inspired to give this sort of voting scheme a try. If you do, I definitely want to hear about how it works out! What about the poor who cannot afford to pay, but nevertheless care about the outcome of the election results, particularly in developing countries, like India? Isn't that what we're doing now? When Sheldon Aldeson calculates out the cost/benefit ratio of his investments in bribing political campaigns, it is an investment that helps him. I'd like to see the voting curve steeper. 1 vote = $1, 2nd vote = $10, 3rd = $100, 4th = $1000, 5th = $10,000, 6th = $100,000, 7th = $1,000,000 etc... each vote more expensive by a factor of 10. However, if this were ever to be implemented, it still wouldn't change the fact that the rich are going to donate to campaigns more than the poor. It won't eliminate political advertisements or PACs or Super-PACs. Hence, this will actually ENHANCE the rich's influence, not equalize it as assumed in the "The first concern..." paragraph. It doesn't matter how steep you make it, the better 'buy' is direct purchase of others' first votes, which is where the money will go. In "normal" democracies, it's Illegal to purchase votes. Would the aim still be to keep it illegal, or would that just be seen as a rational extension of the system? What about money or volunteer hours or other charitable donation? This system could do a lot of good, both for our federal coffers and understaffed charities. Too bad it's so anachronistic to the American ideal of democracy that it doesn't stand a chance of implementation. Interesting idea on adding volunteering as a form of currency. Not sure it is practical to monitor, though. As an european, it's always interesting to see both how "bad" your voting strategy is, and to see the Stockholm syndrome caused by the widespread corruption. Economists are no longer trying to stop the corruption, merely systemize it. Like many economic and political science theories, this may sound good on paper, but end up being pure crap in reality. Do you think that mine owner who sent his employees the "if Mitt doesn't win you could all lose your jobs" would hesitate one bit to add $5 to each employee's pay (or more likely threaten to withhold $5 FROM their pay) to entice force them to vote for Mitt. Or that Sheldon guy who's given $50 million to Newt and Mitt won't try to buy the election? Just because the current system does not do enough to restrict the wealthy from bastardizing democracy does not mean we should say "screw it" and let them win - even if the theoretical methods create better (but NOT best) results. One person, one vote - period. Our system already allows those with more money to exert more influence. One huge problem with letting real elections work like that would be the fact that electoral systems are used to decide on the rules for those systems. No amount of television selection bidding will affect the way televisions are selected, but politicians can and do alter the way that they are themselves elected. Imagine the following progression: The first new election uses $1 to start with quadratic growth. Later, the rich vote that this changes to the "more fair" system starting at $2. Several more iterations later, the rich have voted that the best system is $1,000 with linear growth fully tax deductible, and the poor have long since stopped having the ability to meaningfully influence results, even in aggregate. Somewhere along the line, restraint in rigging the economic rules to favor the rich would likely have dropped off, too. The self-modifying nature of election rules makes their balance precarious. Slippery slope arguments very much apply when there really is an analogue to momentum in the system. I'd also note that a system that overtly and explicitly favors the rich is very much at odds with both our inherent sense of fairness and the manufactured consent view of democracy. It's probably not great for the long-term stability of the country trying it, either. Sometimes someone buys the "election". We're going to this restaurant (which you may not want to go to). It will be my treat. You didn't quite get it right, each vote is proportional to the number of times you previously voted; so it's 1+2+3+4+... which is a triangular number; goes as a square of the number of times you voted. The other cunning thing is that the cost of voting is given back out evenly to all the other voters or registered voters. That means that even if somebody buys the vote, everyone else gets compensated. So (for a fictitious example) even if Donald Trump spends more than a million pounds to buy an election that has a thousand people voting, they each end up with a thousand pounds to compensate for the fact that they would no longer have a wind farm or whatever next door. Would we be able to deduct voting payment from our taxes? I think the fallacy is in the article itself where the argument is made that the rich SHOULD have more political influence because they are rich. That's a circular argument. Perhaps we should be looking at ways to balance the system to make the influence of the rich less than it is now, rather than more. But there's also a scaling here. Casting 500 votes would be $40M. Right now that's a bit less than greedheads like Sheldon Adelson are paying to buy the current election. So if the richest 500 Americans paid $40M for 500 votes each this would be 250,000 votes. And it would cost $20B. Of course they'd write this off their taxes, etc. And would 250,000 votes be enough to swing an election? Isn't money a poor metric of "how much people care" due to the fact that money, like most things, provides decreasing marginal utility. That is, if Bill Gates and I both equally "cared" about the result, we wouldn't necessarily assign the same dollar value to that level of caring because the marginal utility he gains from those extra dollars is much less than me purely because he has so many of them. $1,000 means a lot more to me than it does Bill Gates. If both of us spend $1,000, that expresses a lot of "caring about the income" on my part, but very little on his. $1,000 is pretty meaningless to him. Just because someone spends more does not mean they care more. They could actually care less. It all just has to do with the relative value we place on the dollars spent, which, in turn, is a function of the total amount of dollars we have at our disposal. It's sort of funny how integral the idea of diminishing marginal returns is to so many economic theories and how often it's so utterly forgotten once people start talking about the efficiency of the price mechanism, totally forgetting that the units of that price are subject to the same diminishing returns as everything else and are a function of the buyer's total stock of dollars. The assigned dollar value is NOT purely a function of how much they care about the thing they're buying, but also a function of how much they care about those dollars. Two separate issues are being conflated in one number. Now ponder that idea within the context of extreme wealth inequality and what that means for the efficiency of the price mechanism. We should be able to vote multiple times on this topic. Money is a ridiculous mechanism. A much better system would be a 10 question knowledge test, that confirms your understanding of the political positions/philosophies of the conservative/liberal agendas: ie supply side taxation vs progressive taxation. You answer all questions right you get 10 votes. You answer none or 1 right you get 1 vote. The politicians spend so much money and time blurring the lines, that if you don't know which party favors climate change legislation then your vote should not count as much. Next Post »Is Tuition by Major a Good Idea?